PlatinumGames is a development studio that, for a number of keen gamers, is synonymous with quality action titles. In addition to original titles on Wii U such as The Wonderful 101 and Bayonetta 2, and most recently co-developed Star Fox Zero. Just recently there was surprising news that Tatsuya Minami had left his role as CEO in late March, an original member of the decade-old company and a developer with a lengthy and impressive track record back to his Capcom days. Kenichi Sato has stepped in as a replacement, and the company has since issued a statement around the changes. As you may or may not know, this year is our 10th anniversary. We feel this is the perfect opportunity to reform our internal structure in order to strengthen our position as a developer, and changes in personnel affairs are a natural part of that. Sato-san has also released a statement, insisting that the company will endeavour to continue to work to the highest standards. I have recently assumed the position of President & CEO of our company, following the departure of Tatsuya Minami at the end of March 2016. With this, our board of executives now consists of myself, Seigo Tabira and Atsushi Inaba. Please note that this change in staff structure in no way affects our dedication to our craft. I have utmost confidence that we will continue to create games to the same high standards that our partners and fans have come to expect from us. The company continues to work on a number of licensed and third-party titles, though a notable new IP is in development - led by Hideki Kamiya is Scalebound, which is due on Xbox One in 2017. 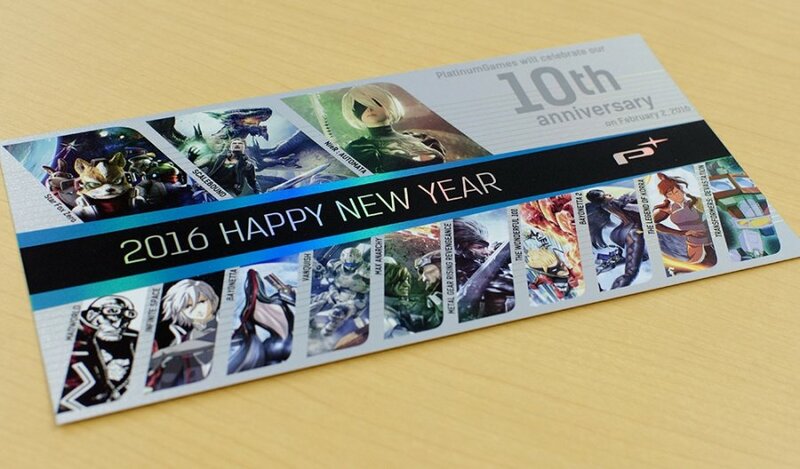 Here's hoping that PlatinumGames continues its good work in the months and years to come, with a continued output of original games in addition to contract work. Naturally we also wish Minami-san well in his future endeavours. I don't know why but something tells me we aren't being told the full truth behind this and I fear it maybe a bad thing. Bring out Viewtiful Joe 1&2 on wii u or ps4 or make HD remake please so much fun when they came out on gamecube many years ago. I am sure they will long continue to make great games. Not sure what to think of this either. Star Fox Zero is a good game, it's just not the same Calibre as Bayonetta 2. I really enjoy it, but there is somewhat a lack of content. Aren't they doing the new TMNT game? Or was that not announced before that card came out? @Madder128 I think Platinum was brought in for Star Fox boss battle designs, right? Plus the time schedule and amount of content wasn't up to them. The boss battles are great, so no indication of any quality slippy in that game that I can see. Talk about a non story. @aaronsullivan how have you found the controls ? I'm enjoying the game the reviews have been harsh. @Nik-Davies yes they are, multiformat release. Bloody hell man Nintendo, buy them already! Nintendo needs to do the same thing... Time for a new direction. @TheFatPlumber They have said repeatadly they want to stay independent. Besides, they have worked with Nintendo on 4 games during the last 3 years or so, so it's not like buying them will make much differense. @TheFatPlumber I would love Platinum to become a Nintendo first party and they have expressed interest in the past to become second party, but it won't happen. Or it won't until at least after Scalebound and Nier Automata is done due to other publishing contracts they are under. Though I would like them to make Bayo 3 on NX. Come Nintendo give them the green light! @Danrenfroe2016 give the new President some time jeez. He is still finishing off stuff that Iwata signed off on. He probably still planning what he wants to do and stating to carry them out. Give it at least a year before asking for another shakeup. Considering the high quality of their games I am not sure a reform is necessary but as long as the quality doesn't drop as a result then I am okay with this. Also we really need another Okami game but considering that there is an Amateratsu costume in Monster Hunter Generations it is likely that the IP is owned by Capcom. That doesn't mean they can't contract Platinum to make it though! Here is to another 10 years of quality games! When was the last time Nintendo acquired a studio like Platinum Games? Nintendo, get on it. Well then, guess that's the end of that chapter. I hope this doesn't mean the end of PlatinumGames' quality stuff. I mean, I know they won't stop making games and stuff, but I hope things don't change in the way of the love and attention to detail that's put into them. They're one of my favorite studios alongside Level 5. Any chance of TMNT and Transformers from Platinum coming to WII U or NX? Sounds less than amicable, if they believe kicking old personnel is the way to advance the company. Oh yeah, I forgot Platinum was the same team that developed the Korra game. Neat. Not that I ever played it, because it didn't come to Wii U. Although I'm still upset about that scene in the finale, which I... won't talk about for the sake of getting banned. Why do they need reform? Bayonetta 2 was pretty much the best thing they've made. Star fox doesn't feel like a PlatinumGames's game. It is slow and not exuberant like their past games. Compared to SF64, this new one is tedious. People just want to fly and shoot like Starwar, no one wants to go around attaching a silly robot to hack computers. So many slow and boring parts in this game. Ha, brilliant, Stannis. Though I like W101 and B2 an immense amount, there is truth to your post! @Madder128 Star Fox controls are pretty great. No denying they take some adjusting at first. It wasn't until the end of the first stage 'til it clicked and I liked them. For me, the whole game ends up being this really satisfying exploration of managing these very different types of vehicles. I can see why some people might fight that the whole time and just want to blow things up but that's where I find the joy in it. My 7-year-old and I played through the whole game using co-op and it was so much better than I'd imagined. I controlled the steering of the ship most of the time and the back and forth communicating to set up shots is fun. (A bit like the Millenium Falcon in Jakku scene from The Force Awakens actually). One flaw is that, unless we are missing something, when you get to new stage and want to play co-op you have to start the mission and then kick back out and then start the stage again to get the choice to play co-op. I was worried my son wouldn't be able to handle the single-player controls but he breezed right through the first few levels shooting in all directions as necessary. He favors the GamePad screen. I haven't had time to finish it myself in single player and explore all the alternate paths and stages. The pacing is very interesting. The stages aren't drawn out and there's very little repeating. Seems like they could have extended out what they have over twice as many stages, but I prefer it this way where each stage has a distinct flavor. Anyway, I'm going on and on. short version: I found the controls a bit weird for up until the end of the first stage. Holding the GamePad up vertically while resting my arms on my elbows does help me switch between the views quicker, but I love all the maneuvering the game explores. There are a couple slower paced stages to change things up, but after playing them again I realized how my first approach to them was unnecessarily pokey. As for being a Platinum game, it isn't, right? This is a collaboration and my understanding is that the initial impetus to bring Platinum in was to punch of the boss battles.